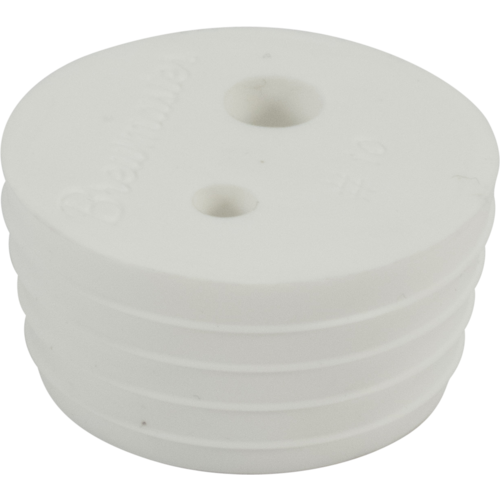 This stopper has two holes and we use it in the production of our stopper thermowell. It features one 3/8" hole and one 1/4" hole. A racking tube or stainless tube can be inserted into the 1/4" hole with the aid of some lubrifilm, forming an airtight seal, and the 3/8" hole fits an airlock. Even after you wedge all these fittings into it, it still fits a plastic carboy neck! Use this in any configuration you can think of, it'll fit: Airlocks, Thermowells, Racking Canes, and anything else you can imagine! Gotta plug up that fermonster somehow! 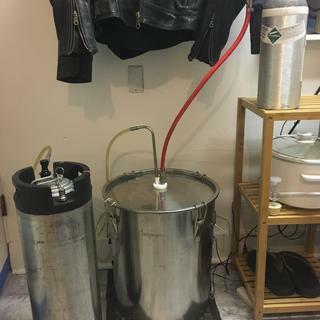 Closed keg transfer from a 7gal fermonster. Iâ€™m going to start using 5 gal. water jugs to ferment in. Will this work with the fermonster? BEST ANSWER: Yes. I am using it with my 7 Gallon Fermonster. Works so much better than traditional stopper which tends to slip when wet. This one is ribbed and locks itself in place ensuring an airtight fit. Yes it works with the fermonster! I use this stopper so I can have an airlock and a thermowell. It does but I feel like it could be a bit bigger almost wants to slip through. Yes. I've used this several times with my FerMonster. It's a good fit. Yes. I use the stopper with a Fermonster. These work great. 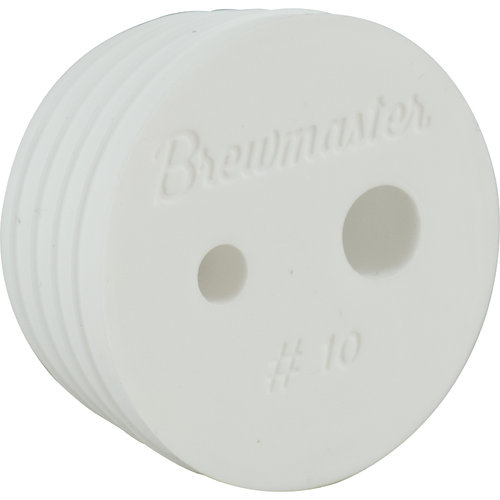 The ridges help keep the stopper in place, and the holes are the perfect size for a thermowell and airlock. It works, barely, but I've nearly pushed it all the way into the carboy several times now and had to lever it out with a racking cane. If it was just a little larger or had a mushroom top it'd be great. As it is, I will be sticking with the standard rubber stoppers. I couldn't find anything to cap my new Best Bottle until I looked at your website. Great idea . Silicone composition allow thorough cleaning and it should last a long, long time. Great addition to my fermenter adding a thermowell. ..way.. under sized, but, again, inexpensive so if it works for you.. I wish it was just slightly bigger. To get a tight seal, you have to basically push this down into the neck of the carboy which makes it somewhat tough to remove. Otherwise this is exactly what I was hoping for.